As a part of Arizona's Science Standards students are to learn appreciation for the scientific advances that have been made, and to recognize those important scientists. Our Harcourt Science book has a fantastic online library of biographies on many such scientists. 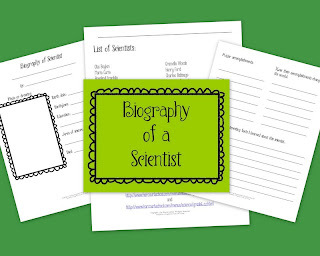 I thought that a fun and short assignment would be for each student to learn about one of these scientists, fill out a mini-biography on him/her, and then share with their classmates. Once complete, I bound all the biographies into a class book that we keep in the non-fiction section of our classroom library. This two-page printable and list of 35 scientists is available in my TpT store for a mere $1! 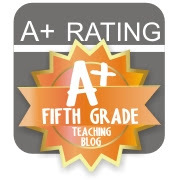 Since math and science are so interrelated, I thought your blog would be perfect for both my husband (he teaches middle school science) and myself (I teach math). I look forward to some interesting articles. Hi Scipi! Thanks for the feedback on my Science Fair Planning Packet and for following me. What do you think of a "Biography of a Mathematician" project? I will definitely be getting this to use for my fifth grade science blocks! Looking forward to reading your future posts. Thanks Stephanie, let me know how it goes. Glad to meet another upper grade blogger! I'm a techie person too, so I'll be reading your blog for ideas!